It is a simple phrase that we use many times every day on the phone without thinking much about it. Saying it this time is difficult. Our family has enjoyed eleven years of friendship and camaraderie with the residents of Beaver Island , through good times and bad. We told my employer that our family would either stay for a couple of years or until all of the girls graduated from Beaver Island School . The latter occurred before we knew it, and it is simply time to move on. It is because of this community that Bev and I have found new and challenging careers to pursue, and we will never forget you for that. In closing, please continue to support the hard-working volunteers of Beaver Island EMS, and perhaps, become one of them. Also, please support the sheriff’s deputy that is eventually assigned to Beaver Island . It is unfortunate that I will not have had the opportunity to introduce him or her to you personally. We are sorry to see you leave. We'll miss you. It has been a privilege and a pleasure having you as part of our community. We will have fond memories of time shared with you and hope that in the future we will meet again. 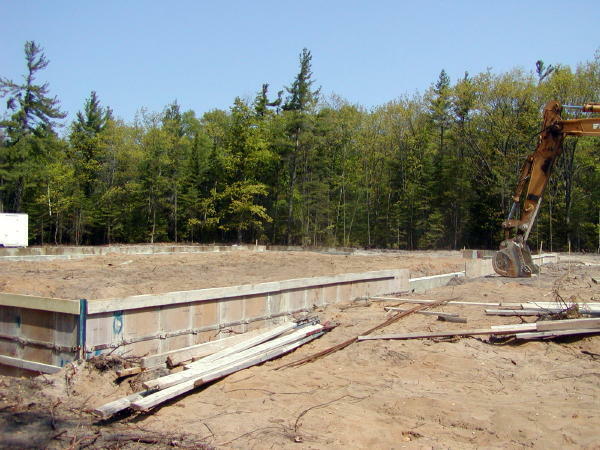 Thank you for all that you've given the Beaver Island community over the past eleven years. Best of luck to you all as you head off for new adventures. Keep in touch! Remember the quilt that the guild raffled off at the Jack Cull Memorial Concert on Memorial weekend? The guild raised a grand total of $3,850. from the ticket sales. They have just sent the Beaver Island Fire Department, Beaver Island EMS and the Beaver Island Rural Health Center each a check for $1283.33!! What a wonderful gift to all three organizations. 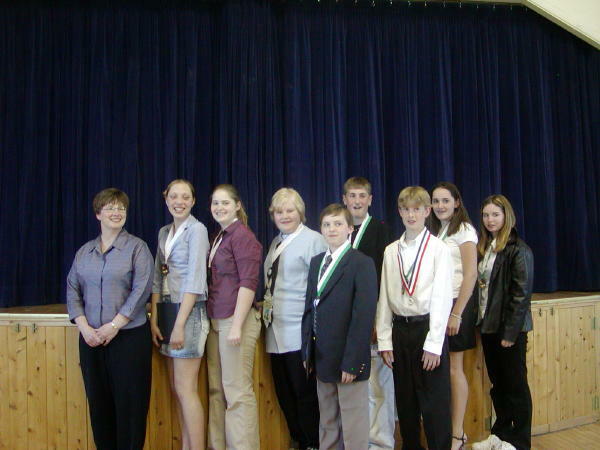 Congratulations to all the students for all their awards for the 2002-2003 school year! 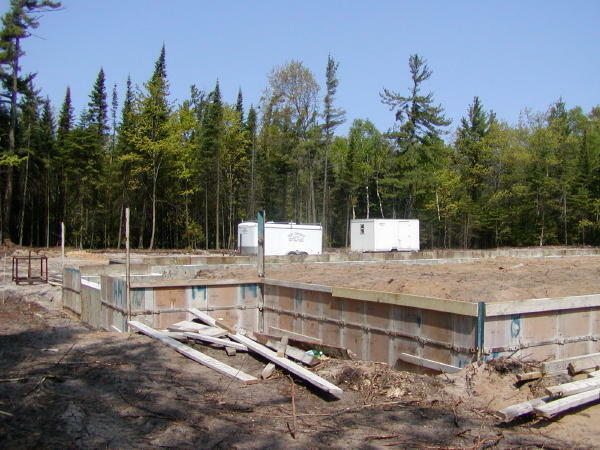 Thanks for Beaver Island Community School Board member Dawn Marsh, this year the school held a ceremony for those students graduating from the eighth grade and heading to high school. Although the graduates didn't wear caps and gowns, each received a medallion. Those with green on the ribbon had obtained a 3.0 or higher during the past school year. This years 8th grade graduates were: Emma Adams, Rita Palmer, Cory Sowa, David Schwartzfisher, Jared Wojan, Saygan Croswhite, Bailey McDonough, David Bousquet (not pictured) and Brenna Green. Congratulations and best wishes as you head into high school. The telephone rang here about 8:20 this morning (June 3rd) and since I'd just sent my crew off to school, I figured that one of them had forgotten something. That wasn't the case. I answered with, "Ok, what did you forget this time?" only to have the other party say, "This is your brother calling you from Iraq". Thank goodness I was sitting down! Ron says he's doing well, that the weather is much like that of the great plains, and things are pretty quiet where he is (he never said exactly where that is). He did say that he's enjoyed all the photos I've been sending him of the island, especially the ice cave ones. I mentioned, just to yank his chain a wee bit, that it might be nice if I'd received some mail from him only to have him say that he's sent me four long letters that are somewhere in the mail. At this point we were cut off as soldiers are only allowed five minutes per call. He'd used the other minutes to try to call our parents who happened to be boarding the ferry this morning on their way to his sons graduation. They would have been thrilled to hear his voice. Anyhow, it's looking to be a great Tuesday if this is any indication. Chuck Carpenter, summer island resident, had promised to show me an old cemetery plot for the past two years and this morning I took him up on it. Traveling through the woods is usually not a pleasant trip for me due to allergies and those famished bugs that announce to all their relatives that I'm available as a movable smorgasbord, however I bathed in bug dope and set out with Chuck to see the old grave. 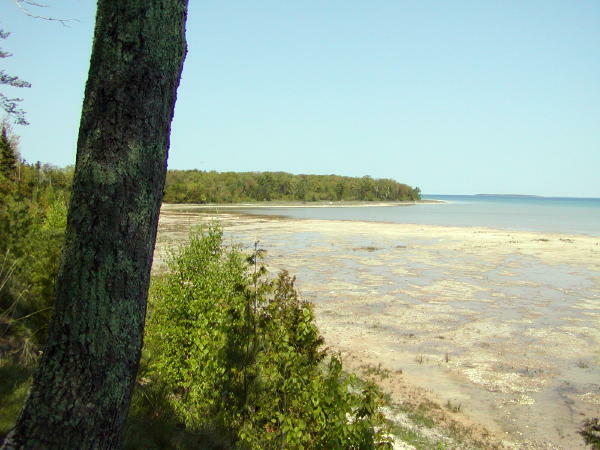 Luckily we were able to drive a good portion so I didn't have to dance, swat, dart and run from the un-official state bird.. the Beaver Island Mosquito. We traveled a short distance through a winding trail and came across this lonely grave that obviously was once tended by loving hands as it was enclosed by what once was a white picket fence. The stone is hardly worn and is easy to read.... Henry Clifton 1820-1877. That's it, no other information is engraved upon the granite. 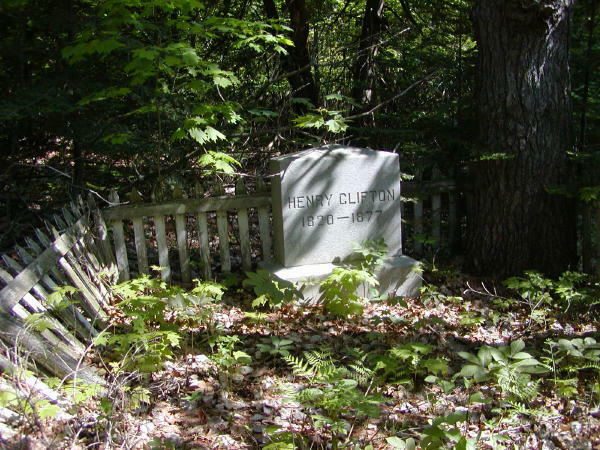 Of course, that only made me all the more curious.. who was Henry Clifton? Frankly, I still don't know who he was in life, or who his family was, but I do know that his funeral service was held on a Tuesday, and that it was on the fourteenth of August in 1877. It was performed by a Reverend George Whitney, an Episcopal minister from Harbor Springs, who was the first non-Roman Catholic member of the clergy to have been on the island as far as we know. According to one witness who attended the service, Reverend Whitney "delivered a practical and impressive sermon." I still don't know who Henry Clifton was, what he did on the island, who his family was, how he died, but I do know that someone cared enough to have bring a minister out to the island for a proper burial, that someone cared enough to purchase a headstone for his grave, and someone cared enough to place a fence around that grave and to keep it in repair for several years. It's obvious that the remains of the fence there now aren't the original.. it certainly can't be 126 years old - I doubt that the wood posts would still be in the condition that they are, so someone cared to keep it in repair until fairly recently. Rest in peace, Henry Clifton. 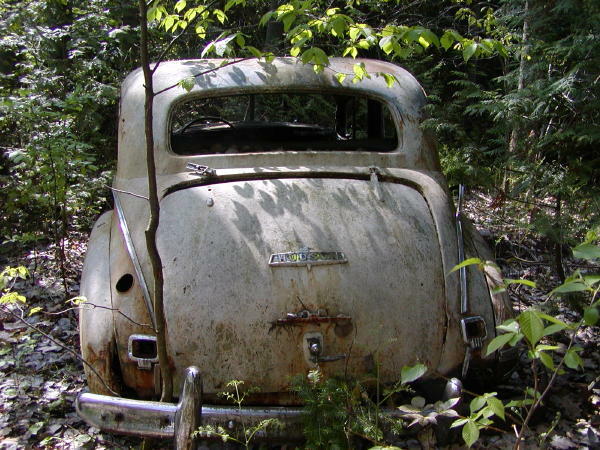 Beaver Islanders have been known to drive some "old" cars which could possibly be referred to as junkers/clunkers or whatever term you choose to use. 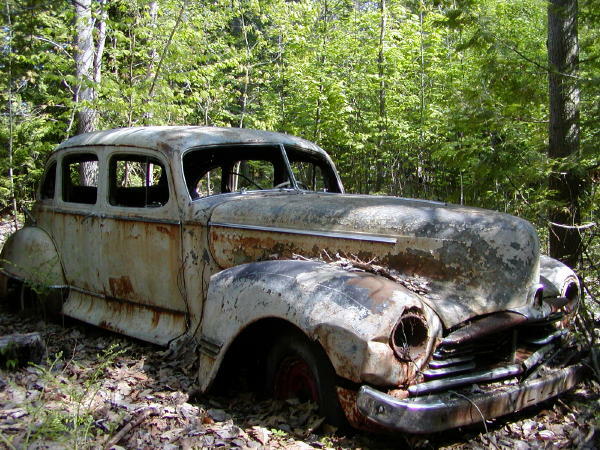 Near Henry Clifton's grave site sits this old Hudson. 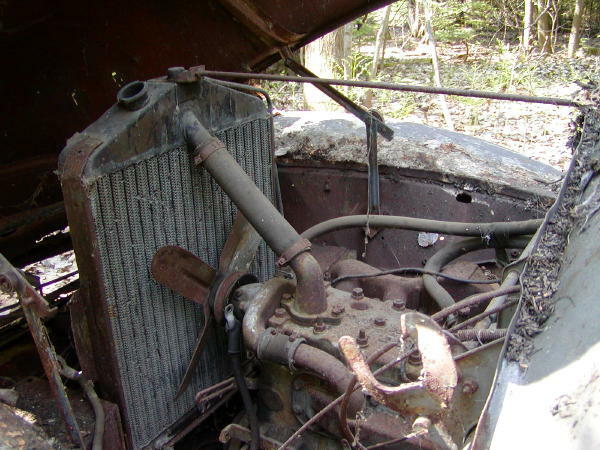 The seats are almost completely gone, although the springs are still in evidence, and the engine is still there under the hood. Might be a possible "fixer upper" for someone. 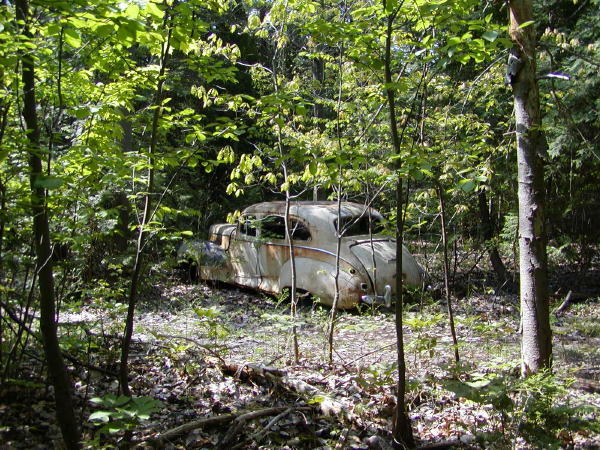 It sits all alone in the forest right where its owner left it. 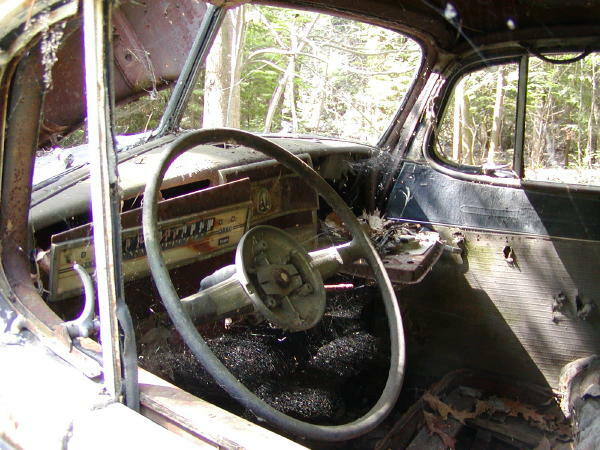 The windows are long gone, but the chrome is still as shiny as the day it came off the assembly line. This was one fancy car in its time, but you may want to call either Gordy or Butler's for a tow as I don't think it'll travel under its own power without some major work. 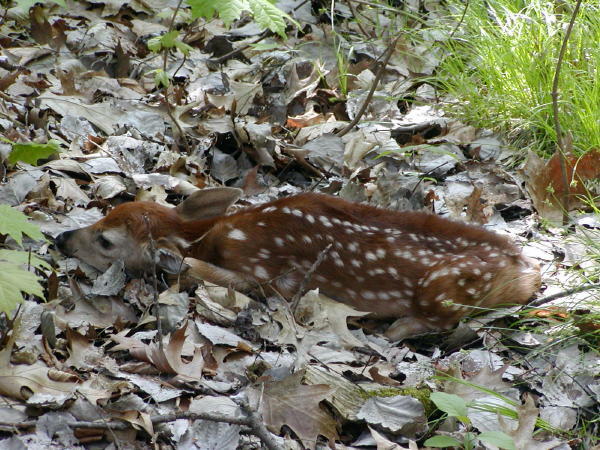 As Chuck Carpenter and I were heading back to my car we almost stepped on this little fellow who was lying right in the path where we'd been walking only about 10 minutes earlier. 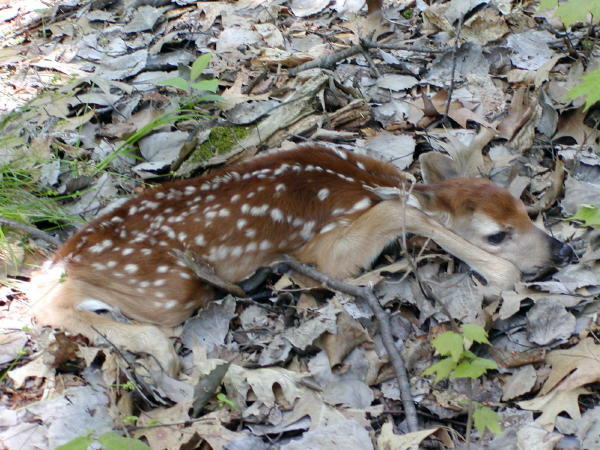 I've never seen such a tiny fawn, he hadn't even taken steps yet. Unfortunately for me, after I took several pictures of him and closed my camera he then decided to hunt for mama and I missed the opportunity of capturing those first shaky steps, wobbles and falls before he got the hang of walking. This is as good a time as any to remind those people who own dogs NOT to let them run. You wanted the pet, please walk it on a leash or keep in penned up, don't just open the door and let it out to "take care of business" as dogs tend to wander farther than you may think. 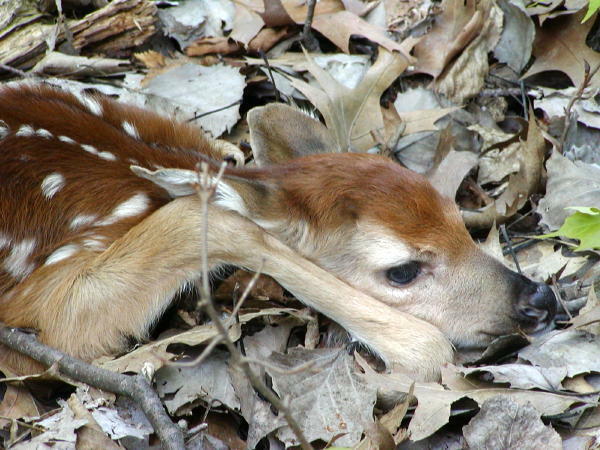 There are all sorts of animal babies out there in the woods this time of year that your dog could kill. Ken and Judy Taylor are touring Norway this month (this part I know to be true). When they arrived in Norway, Ken's luggage went on to Finland leaving him with the dilemma of nothing to wear. This is where my sources become a little fuzzy on detail but Ken wanting to look nice for his arrival borrowed an outfit from Judy's wardrobe, a snappy plaid number with pleats. Fearing that the customs officers would think his "dress" unusual, Ken fabricated the story that the was a Scotsman traveling on an American passport. He then realized that the Terror Alert was orange and was concerned about being delayed for questioning. Thus he changed his story to one more fitting of his outfit. He told the Customs Inspector that he was traveling incognito because he was Mel Gibson's stunt double in Braveheart and didn't want to cause a publicity stir in Norway. Coming under serious questioning, Ken came up with the idea of reenacting a scene from Braveheart by demonstrating that the legend of the kilt is true. There upon gaining immediate access to the country. Ken was last seen still wearing Judy's outfits and signing autographs. Ken and Judy are due back on the Island the end of June and will further clarify or embellish this account of his travels. Anyone For a Walk Over To Garden Island? 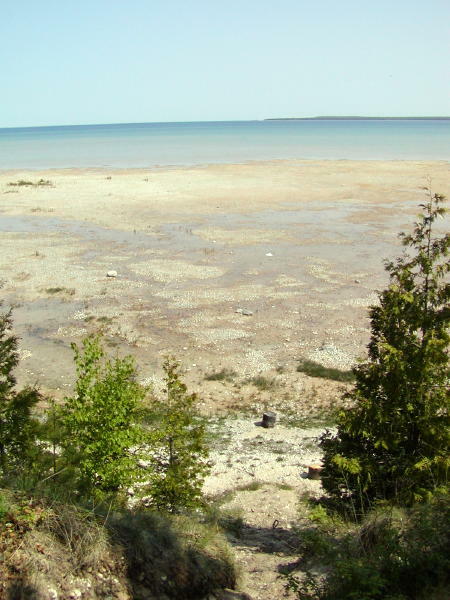 With the water levels so low, beach frontage on the island is growing by leaps and bounds. Pictures taken from the St. James Township Campground show just how much beach there is right now looking towards Garden Island. 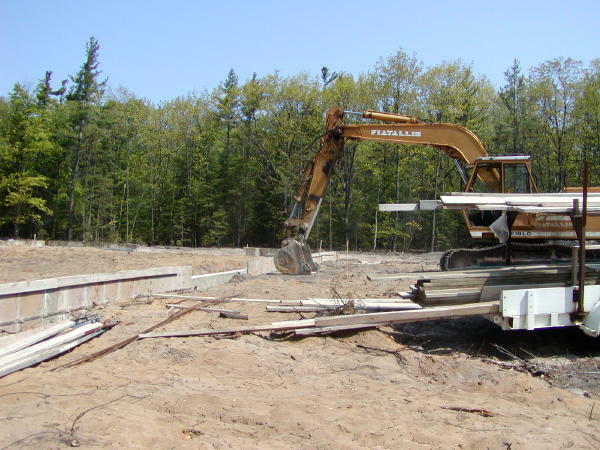 We aren't going to be all that surprised to see realtor signs posted along the "new" shore. If this keeps up much longer, we should be able to walk over to Garden Island without much trouble.